What you do before you start a race most likely will affect how you finish it. Here is an article I wrote for CXMagazine.com last year. It’s an off-the-cuff look at an important part of your race day, food. Originally published December 20th, 2008 here. Welcome back to part II of our interview with Cyclocross Magazine’s Andrew Yee. If you missed part I you can read it here. We continue our discussion talking about the decision to make the magazine a full-time job and what the future holds for Cyclocross Magazine. Thanks for reading. Is CXM your full-time gig? That must have been a leap of faith to take this on as your sole source of income. Yee: In terms of hours, yeah, it’s been all-consuming for over a year now. It’s funny. I could never relate to classmates that pursued careers like investment banking because of the sheer hours they had to put in, but here I am working similar hours. I guess when you’re passionate about something, it’s a lot easier to maintain such a lifestyle. In terms of a leap of faith, I guess that’s pretty accurate, and it almost didn’t happen. I’m a pretty committed person, for better or for worse, and when my buddy Mike couldn’t continue working on the mag, I was in a tough spot. But I felt like I’d always regret it if I didn’t give the young project a chance and see what it could become. And so after making that difficult decision, over time, it required more and more of my time and thus I went from having a full-time job trying to do the mag on the side, to a part-time job, to consulting a bit on the side, to now where I pretty much spend almost all waking hours on Cyclocross Magazine. I really don’t like to do things half-assed, although many days I feel like that’s all I do just because I only get through half of what I want to do. For those of us that love—and even obsess over—cyclocross, print coverage of the sport has traditionally been hard to find. Every once in awhile VeloNews would have a couple pictures, or show a couple bikes in the buyer’s guide. And Bicycling magazine would explain to us how a cyclocross bike is a great option for a commuter bike, with its fender eyelets and optional disc brakes. But there was no magazine devoted to ‘cross culture and ‘cross racing. 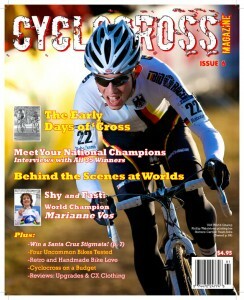 In 2007 that changed with the first issue of Cyclocross Magazine. What started as a brainstorming session for a friend looking for a career in the cycling industry has resulted in a national cyclocross magazine with growing readership and an impressive online presence. Cyclocross Magazine’s Publisher Andrew Yee is not a journalist by training nor does he have a background in publishing. He does have an MBA but is the first to admit that this is not the typical career path for those holding such a degree. What he also has is a passion for the sport, a willingness to do what it takes for Cyclocross Magazine to succeed, and a community ready to help. The publication, much like the U.S. version of the sport, is truly a grassroots affair. Many of the photos and a portion of the articles and interviews are submitted by unpaid contributors that share the staff’s goal of supplying the nation’s ‘crossers with an entertaining and informative periodical.